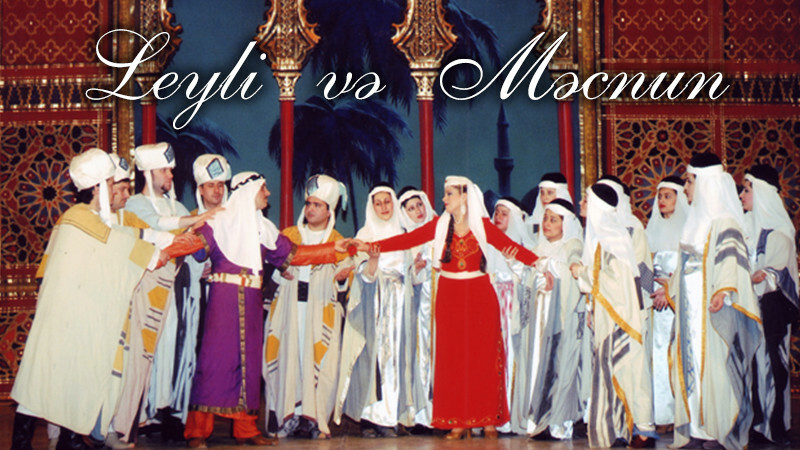 Majnun: Elnur Zeynalov,Leyli: Ravane Amiraslanli,İbn Salam: Tayyar Bayramov,Nofal: Cahangir Qurbanov,Leyli's mother: Afag Agayeva,Father of Leyli: Taleh Yahyayev,Zeyd: Nazar Baylarov,Sheyh: Vugar Aliyev. Desert. Mejnun lives here dreaming of Leyli. He is haunted bu her beautiful vision, in vain does his father ask him to return home. Arabs who are passing bu take an interest in the fate of the young exile. Theiq chieftain Nofel is agitated “bu the youth’s sad storu. He promises to oring Leyli back bu force of arms and warns Leyli’s father about this, sugges­ting that they should reach a peaceful agreement. Leyli’c father turns down Morel’s pro­position.A severe battle breaks out. Leyli’s father begs for mercu and tells them that Leyli has alreadu been married. Nofel orders to stop the battle.